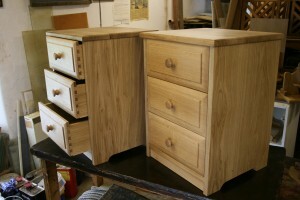 We have always enjoyed making a wide variety of bedroom furniture and are happy to make to order any free standing pieces. Here are some examples of previous commissions. Clean and simple lines were the design brief for this bed. 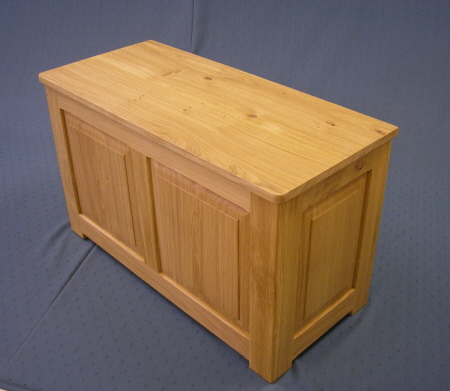 Low platform with sturdy side rails and 3 bolts holding each end make it a very solid piece. 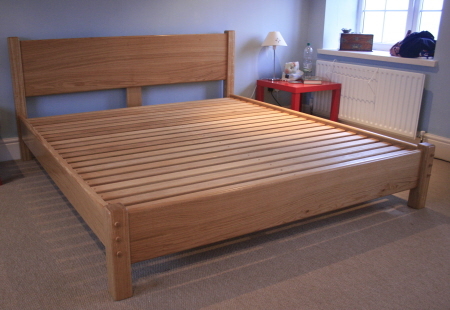 We prefer to build extra strength into our beds to avoid annoying creaks and wobbles. Hand turned pegs cover fixing bolts. 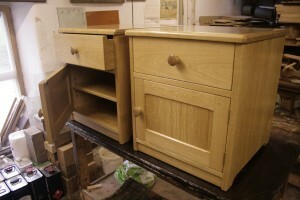 All corners beautifully finished and sanded smooth together with the three neat hand turned pegs demonstrate the level of finish you can expect on all our pieces. We don’t have a standard range of bed designs because so many customers have their own ideas or preferences, so nearly all our beds are one-offs. This one measured 6′ wide x 6’6” x 13” high. Guide price is £1,500. 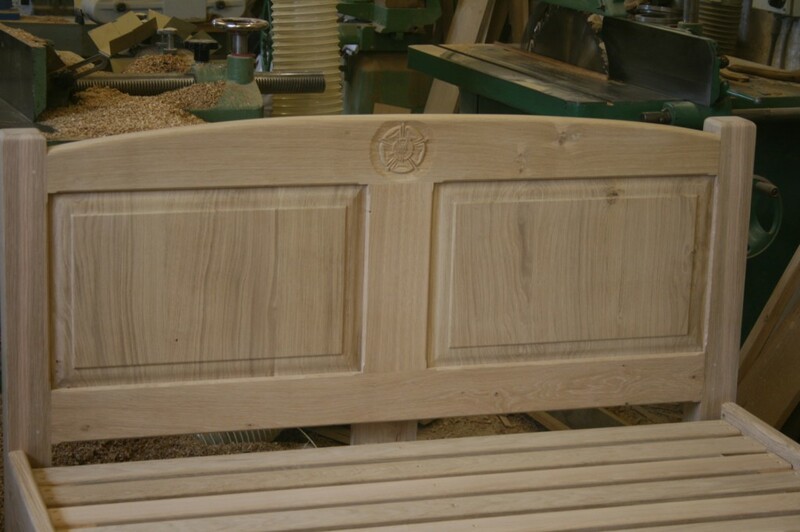 Still in the workshop without any finish on, this panelled version is a standard double at 54” x 78”. The sides and base are made to our usual sturdy formula for a solid feel, no creaks and a long life. 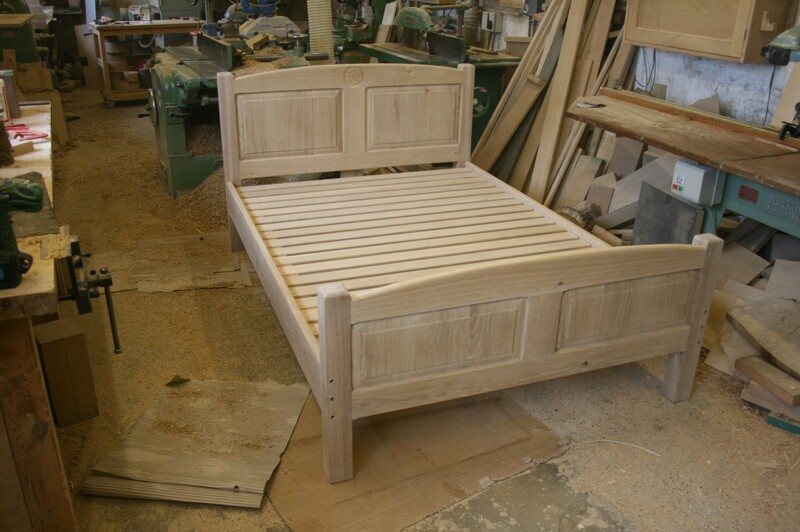 54” x 78” oak bed with panelled head and foot. A Yorkshire Rose was hand carved on the top rail at the customer’s request. 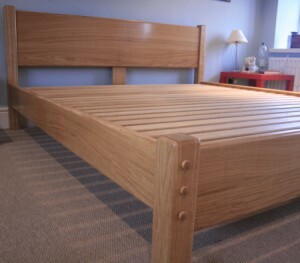 If you are not looking for a large rectangular style headboard, this is a stunning option, here made in natural oak. 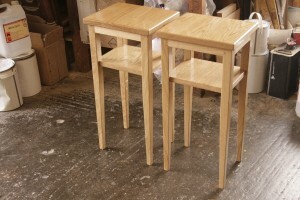 The effect is created by alternating pieces of crown and quarter grained oak. Contrasting timbers can also be used for even greater effect. 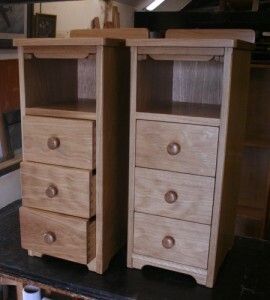 A couple of our 3 drawer bedside cabinets complimented the bedhead. 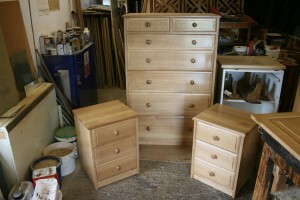 Guide price is £650 for the 54” x 30” bedhead, £450 each for the bedside cabinets. 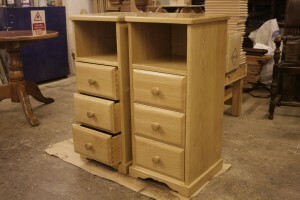 To complete this bedroom set we supplied this 7 drawer Tallboy. Guide price, £1,700. 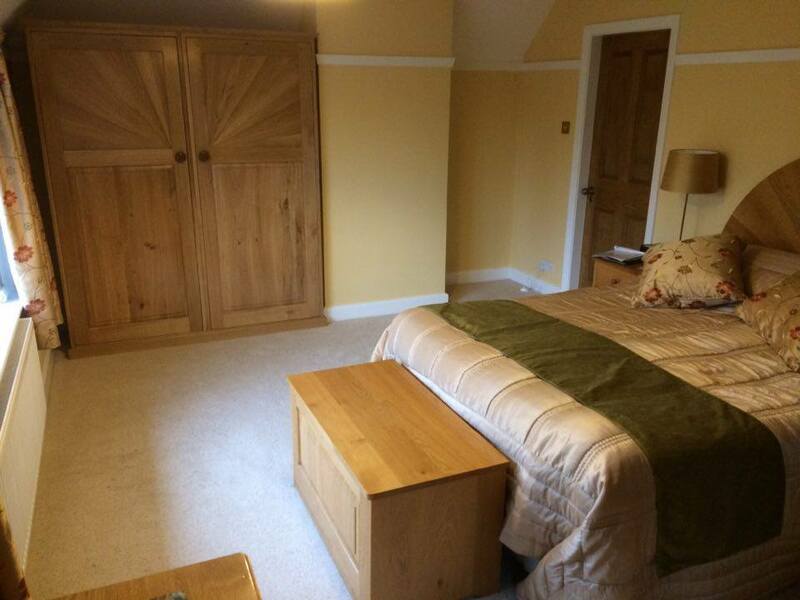 It is always a pleasure to have returning customers, as was the case with this bedroom suite. When this customer relocated themselves they had a need for some wardrobe space, and knew where to come to get exactly the right fit. As you can see we made it a ‘glove’ fit working from our customer’s measurements. 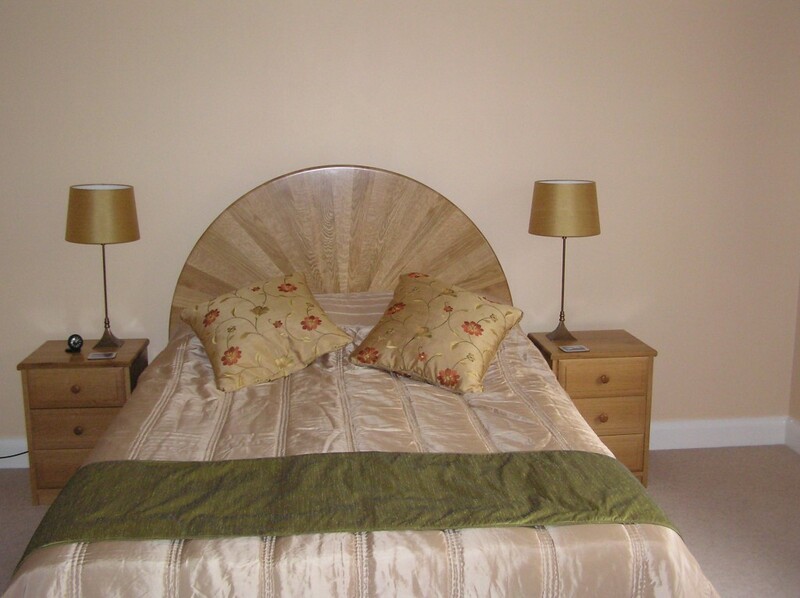 The upper panels were made to match the bedhead and help to make the room look complete. 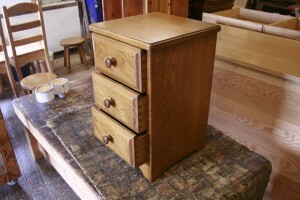 We have made a huge variety of designs of bedside cabinets over the years so I have included photos of a few of them below. 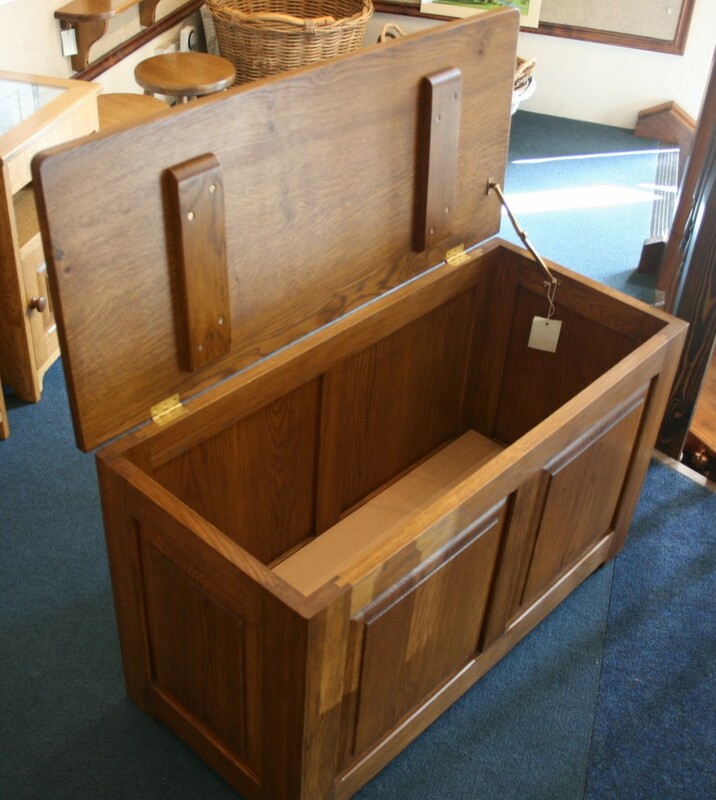 Blanket Chests are still very popular and offer practical storage in the bedroom. 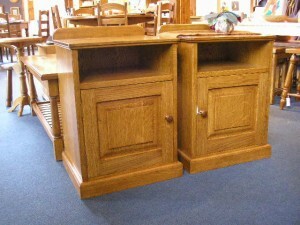 We can offer these in a wide range of sizes, from around £525 to £699 for most popular sizes. 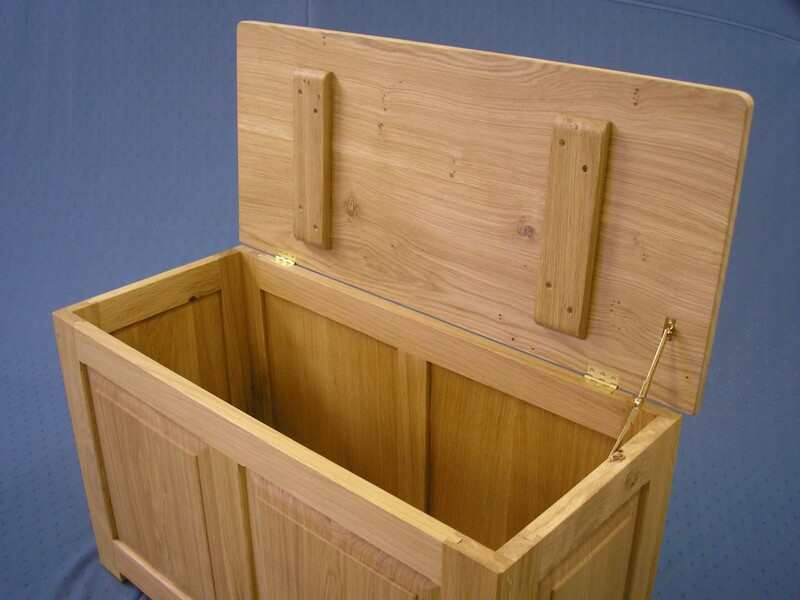 We have recently sourced some lid stays that will hold the lid in any position, making them suitable for children’s toy boxes by avoiding the danger of trapped fingers.